NWLA Tournament official Carl Coffee shares his takeaways from this year's tournament, several players and observers share their thoughts on the tournament action, and The Drop's Paul Cooke breaks down the strategy and skills behind winning the tournament by examining this year's champions the Wiff is Life League Waves. Carl is a longtime member of the NWLA Tournament Organizing Committee and one of the founders of the tournament. The NWLA Tournament has an interesting history. The first five years Chris Gallaway ran the tournament and outdid himself each year. Year 6 was not a failure, but it sure was not a success. Wifflers care deeply about stats and videos and we got both wrong. Year 7 to me was a do-or-die year for this tournament. If we once again failed to give wifflers basic stats and video, I am not 100% certain there would be enough interest for a Year 8. Running a tournament takes a lot of work, but there is no tournament without the players. You get thanked a lot from gracious wifflers who appreciate the hard work you put in to make this tournament run. However, wifflers also need to be thanked. Thank you for driving to a town of 2,200 people with one stop light and crappy cell phone coverage. Thank you for cheering on your All-Star teammates on Friday Night when you probably would rather be in your hotel getting ready for the many games you are about to play. Thank you for embracing the ball boys who look up to so many of you and can’t wait to see you next year. This tournament is nothing without the players and I am not sure I have thanked you all before. As a tournament organizer, this was my favorite year. The NWLA Tournament has been very predictable. For six years, it was constantly the same teams in the top four. I would not say it had gotten boring, but we needed a shakeup. 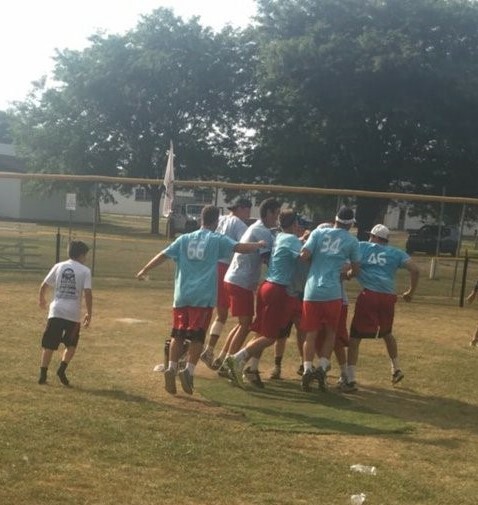 Wiff is Life League (WILL) came in last year very confident, only to go 0-2 in Double Elimination and sent to the Dangerfield Bracket, which is for the four 0-2 teams. They won that last year and then a year later they win the entire thing. From Dangerfield to NWLA Tournament Champs. That is the definition of a shakeup and it opens a door that has never been opened before. WILL did it with team play. You can look at the past champions and if you took out their best player, there would be a lot of doubt that they still could have won. WILL is deep with talent, but I truly believe if you took out one of their impact guys, they would still make that run. WILL did it at the plate. The NWLA tournament has been a pitcher’s tournament, until this year. The scoring this year was up. Are we finally seeing the hitters catch up to the pitching? Is it down because so many big pitchers (Farkas, Loftus, Butrym, Flakne, Harley) were out this year? Was the extreme heat and humidity too much for the pitchers? That is all up for debate, but it is clear WILL won because of their hitting. What kind of door does this open? Other teams that have had a mediocre tournament history can ask themselves, “why not us?” WILL is a young team, with their oldest player this year only 21 years old. It also opens the door to bring in new, young leagues. There are a lot of young leagues out there who may have been worried about competing in years past. Seeing WILL shock the NWLA world could give them hope and finally be the persuading factor that gets them to the tournament. I am very gracious that the Cooke brothers reached out to me to put this on “The Drop”. MAW and the NWLA Tournament are complete opposite styles, but we both play wiffleball. Yes, there are some players who only like one style, or one bat. I do believe however, that there are many others who just want to play in a well-run league, organization or tournament. They will adjust to any style of play. They simply want to play in something that is worth their time, money and effort. The NWLA Tournament works because it is unique. Most competitive wifflers can trace their wiffle history to a league. We have pride in those leagues, and we want to show the country what our league can do. The league vs. league tournament format is something special. So special, that people will pay to come to Morenci, MI, in 92-degree weather, and play for nothing but a Cup and bragging rights. I think Year 7 was a success. 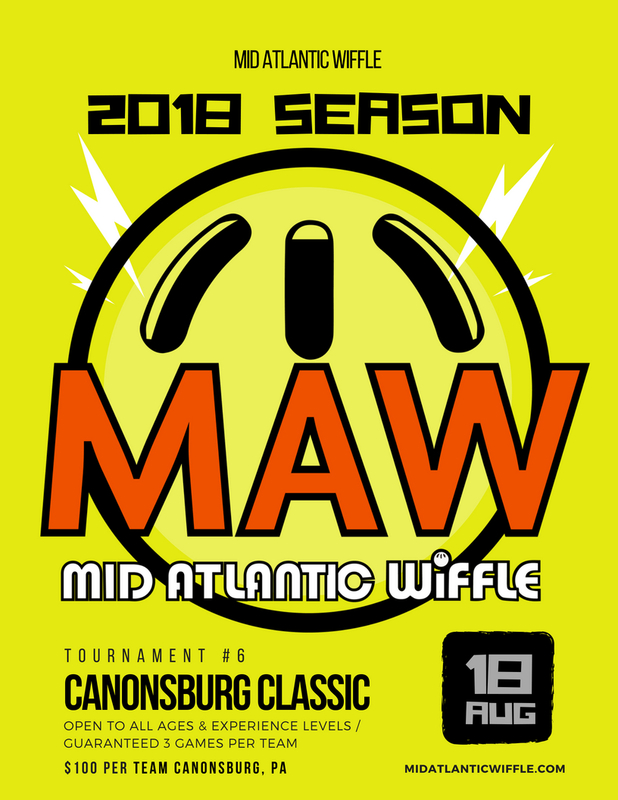 August is almost here which means the final two open tournaments of the 2018 MAW season! The last opportunity to play on our signature fields in York is on 8/4 with "Backyard Brawl". The "Canonsburg Classic" on 8/18 outside of Pittsburgh is a unique chance to compete alongside players from the NWLA Tournament winning Wiff is Life League Waves! Don't miss out! A combination of strike-throwing, athleticism, and team chemistry led the Wiff is Life League Waves to the title. In any game or sport, the rules dictate the strategy. An understanding of that axiom is especially important in competitive Wiffle Ball. Rules among different Wiffle Ball organizations are so divergent that success in one variation of the game can require a completely different set of skills, strategy, and roster construction than what is required in another variation. Regular readers of this site are likely familiar enough with the cut ball, non-base running, big barrel bat version of fast pitch Wiffle Ball to have a sense of the strategies and skills that foster success in that version of the game. But what about the clean ball, base running, yellow bat version of fast pitch Wiffle Ball played at the National Wiffle Ball League Association (“NWLA”) tournament? What does it take to succeed in that environment? Which attributes are unique to the NWLA Tournament rules and which universal winning attributes are necessary for success in Morenci? As an outside, casual observer of the NWLA Tournament who is partial to the MAW, Fast Plastic or Palisades style of game, I honestly had no idea what it takes. To get a little closer to the answers, I set out to watch as many of the streamed games from the two-day tournament as I could, dive deep into the statistics post-tournament, and seek out the opinions of those that had different – and perhaps more relevant – views of the action in Morenci, Michigan than I did. The best place to start is with the impact that clean balls have on NWLA Tournament games. By their very nature, clean balls are more difficult to control than a scuffed, bounced, or cut ball. That is why Wiffle Balls are altered or prepared in the first place. Logically then, a clean ball environment would lead to more balls thrown and more walks, unless the tournament pitchers as a group have mastered the art of throwing unscuffed. Indeed, pitchers generally struggled to throw the ball over the plate at the NWLA Tournament. Over the course of the two-day event, 647 walks were issued in 2,679 plate appearances for a 24.1% tournament-wide walk rate. To provide some context, the walk rate in Palisades WBL – where the 5-3 ball-strike count is the same as the NWLA tournament – through the end of June was 15.8%. In MAW – with a 4-2 count – the organization-wide walk rate was 19.5% through the June tournament. The numbers don’t lie – relative to other fast pitch environments, the NWLA Tournament was heavy on free passes. Without a more in-depth study – and a broader sample size – it cannot be definitively stated whether there is a significant correlation between clean balls and number of walks in the NWLA Tournament. There is, however, enough anecdotal evidence to suggest that it is at least a significant contributing factor. A single person and single tournament sample are never definitive proof of anything, but what if we were to compare Kyle Von Schleusingen’s walk rate in Palisades to his walk rate in the NWLA tournament where the same 5-3 count is used? Through the weekend of June 22nd, “K-Von” had an 11% walk rate in Palisades. At the NWLA Tournament, he walked 29% of the batters he faced. While still allowing for the possibility of other contributing factors – a random off day, a minor difference in the size of the strike zone between organizations – the main difference between those two organizations that would impact an individual pitcher’s walk rate is legal ball prep. It seems likely that K-Von was impacted by having to throw exclusively clean balls and if he was, it is safe to assume others are as well. The Texas Wiffle Ball League’s Will Marshall was in attendance in Morenci as a spectator. In reflecting on the tournament at the request of The Drop, Marshall spoke to how clean balls can impact the competition. Naturally then, team(s) or pitcher(s) that can limit the number of walks allowed hold a strategic advantage in the NWLA Tournament. Those that have seen the Waves in action can attest to the fact that by-and-large their pitchers lack the awesome stuff of a K-Von. The Waves pitchers – with the exception of Jordan Castelli and his power baseball-like curve – come right at hitters with relatively straight fast stuff. “I think their [the Waves] pitching was decent but it was not lights out,” Marshall told The Drop when asked for an assessment of the tournament champions. By contrast, Will singled out Kyle as a player that impressed him due to his ability “to make the ball move in all four planes.” Few would disagree that Kyle has better stuff than the Waves’ pitching staff but in that environment – at least on that day – the Waves’ ability to throw strikes regardless of stuff won out. It is true that in any form of Wiffle Ball, a pitcher – no matter how impressive his stuff is – cannot win consistently if he doesn’t throw strikes. In the clean ball, yellow bat, walk-heavy environment of the NWLA Tournament, however, the ability to throw the ball over the plate with decent velocity is perhaps more at a premium than it would be in other environments. If you followed the scores as they came in over Twitter on Saturday and Sunday, you were probably struck as I was by the sheer volume of runs scored. For example, the 10:00 AM Saturday round yielded the following final scores: 27-0, 13-0, 18-3, and 23-0. While that group of games was on one extreme end of the spectrum, high scoring games were the rule – not the exception – at the NWLA Tournament. 54 games were played over the course of the two-day tournament. 629 runs scored during those 54 games, which averages out to 11.6 runs scored per game. For the sake of comparison, through three Mid Atlantic Wiffle tournament in 2018, 284 runs were scored in 51 games, which averages out to 5.6 runs per game. Through 66 games in the 2018 Palisades season (through the end of June), 292 runs were scored which averages out to 4.4 runs per game. Relative to those organizations, the NWLA tournament was contested in a very high run scoring environment. The high volume of walks – which as discussed are a possible byproduct of clean balls – certainly contributed to the relatively high number of runs. However, the NWLA Tournament batting average of .282 is significantly higher than the batting averages through the end of June in MAW (.215) and Palisades (.195). By no means does this indicate that the hitters at the NWLA Tournament are more skilled, but simply that the high run environment was not influenced solely by the large number of walks. There was hitting to be found – including a homerun about every four at bats – in Morenci. Will Marshall took note of the power output that came despite the use of the thin bats. Certainly, as Will alluded to, factors like the level of pitching talent – whether influenced by the clean balls or not – could and very likely did mitigate some of the offensive suppression expected in a yellow bat-only tournament. For their part, the tournament champions hit well but did not outhit the rest of the field in any significant manner. Their team batting average of .299 was above tournament average while their home run rate of 7% was well below average. The Barrel Bruisers' Jerry Hill participated in the NWLA qualifying tournament in Indianapolis and offered up that athleticism is a key difference maker in this particular environment. "In NWLA, your athleticism can really shine. The ability to run the bases and make fast plays in the field is huge! That same skill set is a plus in MAW - just look at the "Wiffle Ninja", Dan Potter - however the game is a lot faster in the NWLA," Jerry explained. "You've got to make the play and beat the runner . . . Making contact is huge as you always have the ability to out-hustle the play and throw." As a group, the Waves are both young and athletic which are helpful attributes in a base running tournament. While the Waves trailed behind their competition from a power perspective, they made up for it with their ability to beat out ground balls, take extra bases, and force their opponents into making defensive blunders. The base running element is perhaps the most significant difference between the NWLA Tournament style of play and the style of play found in MAW or elsewhere because of the way it impacts pitching, defense, and offense. When a ball is put into play in an NWLA Tournament game, a scramble – by the fielders and by the hitter – ensues in a way that is foreign to non-base running variations. The ability to field a team of all young, quality athletes undoubtedly plays up in that environment. With the Waves’ success in the 2018 NWLA Tournament as a template, it seems reasonable to conclude that the ability to throw quality strikes – even if that means sacrificing movement – with a clean ball, the ability to take advantage of the large number of walks, the ability to hit for average with the yellow bat, and the athleticism necessary to gain an edge on the base paths, are keys to success in the NWLA Tournament. The tricky aspect of scouting a style of Wiffle Ball that is not your own is that we often filter performances through the lens of what we are most accustomed to. To discredit the Waves’ win – not that anyone is necessarily doing it – because their style may not or would not play in another form of the game is to miss the point. The team was built for this version of the game and executed their plan brilliantly. Likewise, I think it is safe to say that most would have done exactly as Jimmy Cole did and put K-Von on their team had the opportunity presented itself. He is far too talented of a pitcher not to. Yet while K-Von is an excellent pitcher in Palisades, he struggled with his command at the NWLA Tournament likely due to the clean ball rules. There were other players and teams at this year’s NWLA tournament that devotees of MAW and other organizations know perform better in other environments. It goes both ways, even it may lean heavily in one direction or the other. Talent evaluators who are able to watch different styles of Wiffle Ball and make the distinction between a general lack of skills and style-specific skills are ahead of the curve. However, there are some elements of winning Wiffle Ball that are universal, particularly intangibles like competitive spirit, calmness under pressure, and team chemistry. It is hard to find anyone that didn't attribute at least some of the Waves’ success to their possession of these qualities. In reflecting on his team’s championship run, Jake Davey also singled out the importance of battling and playing as a team.